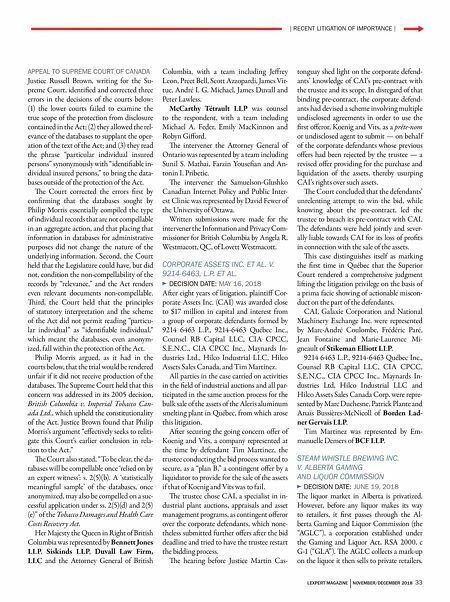 LEXPERT MAGAZINE | NOVEMBER/DECEMBER 2018 33 | RECENT LITIGATION OF IMPORTANCE | APPEAL TO SUPREME COURT OF CANADA Justice Russell Brown, writing for the Su- preme Court, identified and corrected three errors in the decisions of the courts below: (1) the lower courts failed to examine the true scope of the protection from disclosure contained in the Act; (2) they allowed the rel- evance of the databases to supplant the oper- ation of the text of the Act; and (3) they read the phrase "particular individual insured persons" synonymously with "identifiable in- dividual insured persons," to bring the data- bases outside of the protection of the Act. e Court corrected the errors first by confirming that the databases sought by Philip Morris essentially compiled the type of individual records that are not compellable in an aggregate action, and that placing that information in databases for administrative purposes did not change the nature of the underlying information. Second, the Court held that the Legislature could have, but did not, condition the non-compellability of the records by "relevance," and the Act renders even relevant documents non-compellable. ird, the Court held that the principles of statutory interpretation and the scheme of the Act did not permit reading "particu- lar individual" as "identifiable individual," which meant the databases, even anonym- ized, fall within the protection of the Act. Philip Morris argued, as it had in the courts below, that the trial would be rendered unfair if it did not receive production of the databases. e Supreme Court held that this concern was addressed in its 2005 decision, British Columbia v. Imperial Tobacco Can- ada Ltd., which upheld the constitutionality of the Act. Justice Brown found that Philip Morris's argument "effectively seeks to reliti- gate this Court's earlier conclusion in rela- tion to the Act." e Court also stated, "To be clear, the da- tabases will be compellable once 'relied on by an expert witness': s. 2(5)(b). A 'statistically meaningful sample' of the databases, once anonymized, may also be compelled on a suc- cessful application under ss. 2(5)(d) and 2(5) (e)" of the Tobacco Damages and Health Care Costs Recovery Act. Her Majesty the Queen in Right of British Columbia was represented by Bennett Jones LLP, Siskinds LLP, Duvall Law Firm, LLC and the Attorney General of British Columbia, with a team including Jeffrey Leon, Preet Bell, Scott Azzopardi, James Vir- tue, André I. G. Michael, James Duvall and Peter Lawless. McCarthy Tétrault LLP was counsel to the respondent, with a team including Michael A. Feder, Emily MacKinnon and Robyn Gifford. e intervener the Attorney General of Ontario was represented by a team including Sunil S. Mathai, Farzin Yousefian and An- tonin I. Pribetic. e intervener the Samuelson-Glushko Canadian Internet Policy and Public Inter- est Clinic was represented by David Fewer of the University of Ottawa. 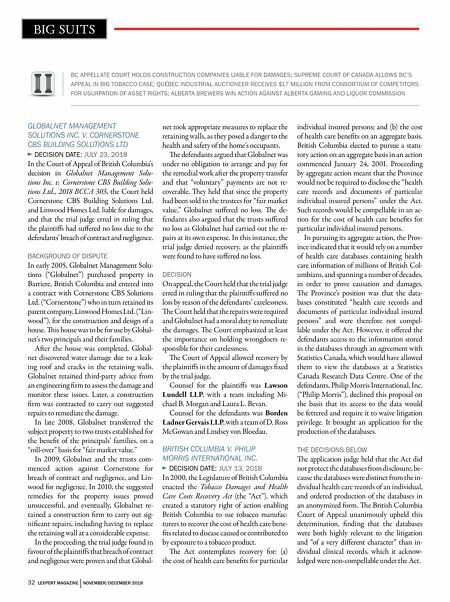 Written submissions were made for the intervener the Information and Privacy Com- missioner for British Columbia by Angela R. Westmacott, QC, of Lovett Westmacott. CORPORATE ASSETS INC. ET AL. V. 9214-6463, L.P. ET AL. DECISION DATE: MAY 16, 2018 Aer eight years of litigation, plaintiff Cor- porate Assets Inc. (CAI) was awarded close to $17 million in capital and interest from a group of corporate defendants formed by 9214 6463 L.P., 9214-6463 Québec Inc., Counsel RB Capital LLC, CIA CPCC, S.E.N.C., CIA CPCC Inc., Maynards In- dustries Ltd., Hilco Industrial LLC, Hilco Assets Sales Canada, and Tim Martinez. All parties in the case carried on activities in the field of industrial auctions and all par- ticipated in the same auction process for the bulk sale of the assets of the Aleris aluminum smelting plant in Québec, from which arose this litigation. Aer securing the going concern offer of Koenig and Vits, a company represented at the time by defendant Tim Martinez, the trustee conducting the bid process wanted to secure, as a "plan B," a contingent offer by a liquidator to provide for the sale of the assets if that of Koenig and Vits was to fail. e trustee chose CAI, a specialist in in- dustrial plant auctions, appraisals and asset management programs, as contingent offeror over the corporate defendants, which none- theless submitted further offers aer the bid deadline and tried to have the trustee restart the bidding process. e hearing before Justice Martin Cas- tonguay shed light on the corporate defend- ants' knowledge of CAI's pre-contract with the trustee and its scope. In disregard of that binding pre-contract, the corporate defend- ants had devised a scheme involving multiple undisclosed agreements in order to use the first offeror, Koenig and Vits, as a prête-nom or undisclosed agent to submit — on behalf of the corporate defendants whose previous offers had been rejected by the trustee — a revised offer providing for the purchase and liquidation of the assets, thereby usurping CAI's rights over such assets. e Court concluded that the defendants' unrelenting attempt to win the bid, while knowing about the pre-contract, led the trustee to breach its pre-contract with CAI. e defendants were held jointly and sever- ally liable towards CAI for its loss of profits in connection with the sale of the assets. is case distinguishes itself as marking the first time in Québec that the Superior Court rendered a comprehensive judgment liing the litigation privilege on the basis of a prima facie showing of actionable miscon- duct on the part of the defendants. CAI, Galaxie Corporation and National Machinery Exchange Inc. were represented by Marc-André Coulombe, Frédéric Paré, Jean Fontaine and Marie-Laurence Mi- gneault of Stikeman Elliott LLP. 9214 6463 L.P., 9214-6463 Québec Inc., Counsel RB Capital LLC, CIA CPCC, S.E.N.C., CIA CPCC Inc., Maynards In- dustries Ltd, Hilco Industrial LLC and Hilco Assets Sales Canada Corp. were repre- sented by Marc Duchesne, Patrick Plante and Anaïs Bussières-McNicoll of Borden Lad- ner Gervais LLP. Tim Martinez was represented by Em- manuelle Demers of BCF LLP. STEAM WHISTLE BREWING INC. V. ALBERTA GAMING AND LIQUOR COMMISSION DECISION DATE: JUNE 19, 2018 e liquor market in Alberta is privatized. However, before any liquor makes its way to retailers, it first passes through the Al- berta Gaming and Liquor Commission (the "AGLC"), a corporation established under the Gaming and Liquor Act, RSA 2000, c G-1 ("GLA"). e AGLC collects a mark-up on the liquor it then sells to private retailers.